magine spending all day looking at the face of a criminal, a missing child, or a murder victim. That's what you'd do as a forensic artist for a Major Metropolitan Police Department. Like Samantha Steinberg, you'd study the faces of the dead, and those who might have made them so, in order to come up with a drawing of what they look like. Steinberg is a formally trained illustrator and graphic artist who chose to leave the glamorous world of advertising behind to dedicate her talents to the world of crime fighting. 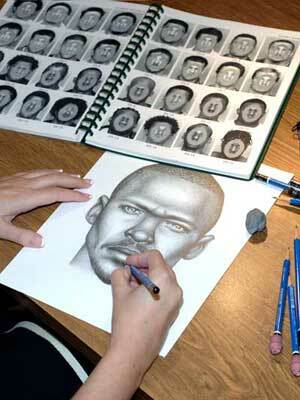 She honed her skills as a forensic artist by training at the FBI Academy in Quantico, Virginia. Steinberg’s crime-fighting artwork has aided in the identification, apprehension and conviction of countless criminals nationwide. Her artwork has been featured on CNN, Fox News, MSNBC, The Today Show, The Learning Channel, America’s Most Wanted and the documentary film "CODE 33." Steinberg has also worked for the CBS hit television show "CSI" by creating a series of drawings, which were prominently featured in a May 2002 episode called "Cross Jurisdictions."